Even if you aren’t a fan of Neil Young, who has been making rock records since the 1960s and is still going strong, you may well become one after watching Neil Young: Heart of Gold, director Jonathan Demme’s latest concert film. Here Demme simply allows Young’s music and banter to reveal the rocker’s pure love of family and yearning for home. Heart of Gold was filmed during two nights at the famed Ryman Auditorium in country music’s home, Nashville, Tennessee. Young, his band, and supporting musicians perform songs from his latest album, Prairie Wind, which he wrote in Nashville while recovering from surgery for a brain aneurysm, as well as familiar tunes to which some members of my audience could not help singing along (not nearly as well as Young’s backup singers did, I must add). The film gets off to a slow start, with members of Young’s musical “family” riding around Nashville in a Cadillac recalling how they started recording with him in Nashville in the 1960s and ’70s. During the first fifteen minutes, I wondered whether Heart of Gold would be another nostalgia trip primarily for fans in which band members drop names and pat themselves on the back for being in the right place at the right time. Shortly after we are shown the majestic Victorian-era Ryman Auditorium (built as a tabernacle for revivals and home of the Grand Ol’ Opry from 1947 to 1974), however, the concert begins and the rest of the film focuses solely on the show. From this point on, all names dropped and backs patted are by Young himself during his humble between-song remarks. In retrospect, that slow opening section is likely there to explain his recovery from a brain aneurysm, which explains some of the lust for life that drives Young to continue writing and performing his music. It is the humility and gratitude in Young’s songs and patter that endear him to us. A self-described “rich hippie” who has performed more often than not in jeans and flannel shirts, his sartorial choices here honor the show’s setting: he is natty in his elegant suits and felt hat, his band members looking equally sharp. During the show, we see his loving glances at his wife, Pegi, who sings backup with Diana DeWitt and country-and-bluegrass diva Emmylou Harris. His newer songs are reflective, sweet, and sometimes so sentimental they verge on sappy, but as he sings about coming to terms with his father’s dementia and recent death, his favorite hound dog, and seeing his peers succumb to drugs, his depth of feeling is honest and moving. The band performs in front of a changing backdrop of photos of sky and wheat fields, highlighting Young’s love of the Canadian prairies of his youth (and his adulthood home). With backup from the Fisk University Jubilee Singers, The Nashville Strings, and even a horn section, the songs’ arrangements here range from lush to spare, all of them revealing a strength in a song or a riff or a vocal. Young asks, “Is there a guitar player in the house?” which is funny because seven people with their acoustic guitars fill the front row of the stage. 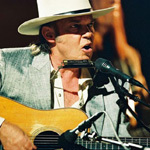 As the closing credits scroll on the right side of the screen at Heart of Gold’s close, Young performs a final song seated alone on the stage with his acoustic guitar and microphone, warm light filtering in through the colored glass windows from the stage of the empty Ryman Auditorium. It creates a lovely, solemn coda to the film. Heart of Gold is a reverent film, with no audience shots, crazy camera angles, or quick cuts to pull our attention away from the musicians or the music. Often, the focus is tight on one side of Young’s half-whiskered face; just as often, the smiles of the backup singers as they reach for their notes fill the screen. Fans and even those only passingly familiar with Young’s songs from their 40 years of rock radio airplay will find Heart of Gold a pleasing package of new-yet-familiar tunes performed by a man who has survived against all odds and still isn’t afraid to say what he sees, whether it’s profound or downright silly. Director Demme doesn’t electrify us here as he did in 1984 with the great Talking Heads concert film Stop Making Sense, but he allows us to peer behind Young’s gruff ole-boy appearance to see the joy of living in this prolific observer of all that makes us human.